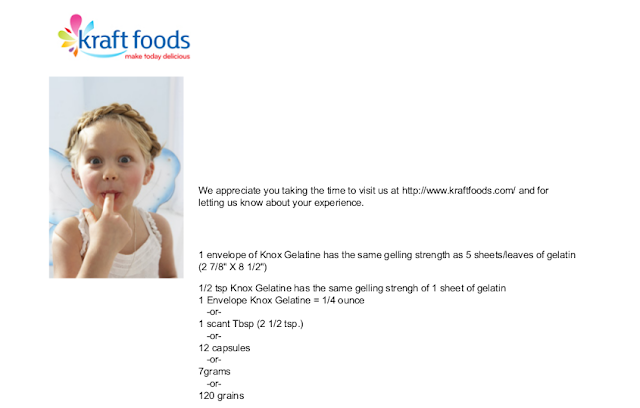 As Knox Gelatin is the most widely available in the United States and as some recipes call for gelatin sheets and some even for certain bloom strenghts, I wrote Kraft about their Knox product. Below are email responses from them. Below, a mistake. The entire box of Knox is the same as 5 sheets of gelatin. I quote: "1 envelope of Knox Gelatine has the same gelling strength as 5 sheets of gelatin ( 2 7/8" X 8 1/2") - I'm pretty certain that 1 envelope equals 1 sheet. This is based on a bloom strength of 225 for both the powder and the sheet.